When you purchase this plant, it will sometimes come in a gift vase, full of water with gravel at the bottom to give it stability. Most often, though, you will select the number of stems that you want from a container holding many stems of various sizes and shapes. They will be wrapped, and you will be on your way. So when you get home, you will need to select a proper vase for your new plants. There are a number of ways to go: You can fill a shallow vase 4 to 5 inches deep and, perhaps 6 inches across, with someone holding the plants in place, fill it with gravel to about an inch from the top. They will stand where you set them, especially if they’re well-rooted. Recently, I saw a group of several plants, perhaps 12 to 15 inches tall in a tall cylinder vase, one about 20 inches tall and perhaps 6 across. A base of black marbles, 4 or 5 inches of them, made for a stunning and exotic display. For the best success, I would suggest using bottled or rain water. Really, it does not take a lot — a 25-cent bottle will usually be enough, even when you change it every couple of weeks. The plant will love you for it. Every couple of months, when you change the water, add some water-soluble fertilizer at about 1/10 of the suggested strength. And, yes, they can be planted in a pot full of soil, provided that the soil is light and airy and that there is a drainage hole at the bottom. While this plant thrives in water, it does not like to be in soggy soil. It will rot and die. The plant likes good light, but hates sitting in direct sunlight, and the leaves turn yellow and die. When leaves do go, gently remove them, exposing a node. With luck, the plant will reward you by throwing off a branch from each. Although not fussy plants, they do require a certain amount of care. 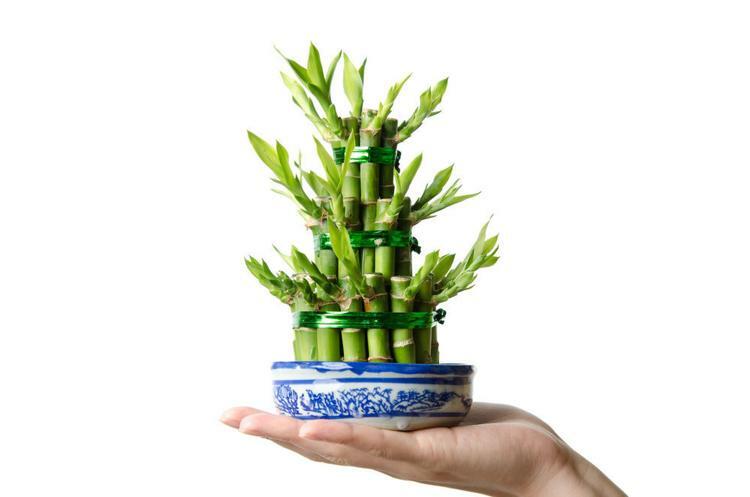 • “Why was the plant so named?” According to feng shui, the lucky bamboo plant attracts positive energy that is supposed to bring good health, peace, happiness, prosperity and longevity, as well as good luck into the home that has this plant. • “My white roots have turned black and brown. What shall I do?” Cut the stem 3 or 4 inches above the water line and place it in a fresh vase with bottled water, and it will most probably make new roots within a couple of months. Be sure to change the water regularly. Next week, the meanings attached to lucky bamboo and propagation tips. This entry was posted in Flowers, Plants and tagged Cosentino Florist, Garden, Plants. Bookmark the permalink.